This is an amplifier type often referred to as the “Darling”. 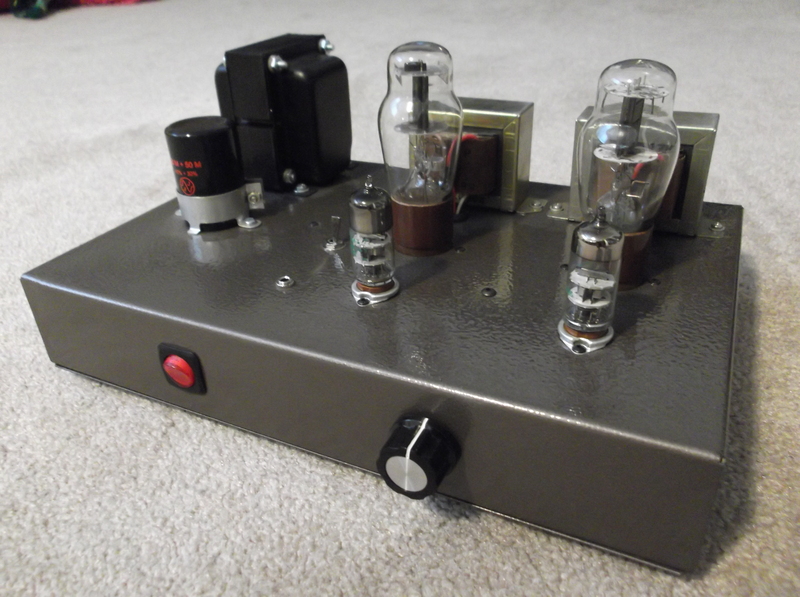 It uses a WWII-era oscillator triode, the 1626, as an output tube. This is all about finesse, as the power output of this tube is only 3/4 of a watt! This is built on a hammertone-finished steel chassis, and features volume control and headphone jack. This was built as a gift for my wife, and she uses it in her office with mini speakers, or headphones, and her IPod as source. Here is the schematic for the 1626 SE amp. A three-stage CLCRC power supply filter was needed to reduce hum to inaudible for headphone use. A voltage doubler supplying DC to all filaments was used for the same reason. Otherwise a very normal audio signal path. The 6J4/8532 is an interesting tube to use here. It is one triode per tube, and often microphonic, meaning it picks up mechanical vibration and amplifies it. This means I had to try several before finding two good ones. The 8532 version of the 6J4 is usually better. Another feature of this design is that the two channels share the cathode resistors & bypass capacitors of each stage. Although output is an amazing 3/4 of a watt, it sounds very nice on headphones and speakers that are sufficiently efficient.